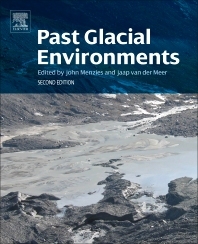 Past Glacial Environments, Second Edition, presents a revised and updated version of the very successful first edition of Menzies’ book, covering a breadth of topics with a focus on the recognition and analysis of former glacial environments, including the pre-Quaternary glaciations. The book is made up of chapters written by various geological experts from across the world, with the editor’s expertise and experience bringing the chapters together. This new and updated volume includes at least 45% new material, along with five new chapters that include a section on techniques and methods. Additionally, this new edition is presented in full color and features a large collection of photographs, line diagrams, and tables with examples of glacial environments and landscapes that are drawn from a worldwide perspective. Informative knowledge boxes and case studies are included, helping users better understand critical issues and ideas. John Menzies is Professor of Earth Sciences & Geography at Brock University in St. Catharines, Ontario, Canada. He obtained a B.Sc. at the University of Aberdeen and a Ph.D. at the University of Edinburgh, Scotland. He immigrated to Canada in 1977. His main areas of research and expertise lie in Glacial Geomorphology and Sedimentology with a special interest in the subglacial environment and in drumlins and microsedimentology in particular. He has established a microsedimentology lab at Brock and, over the past decades, has developed a major research interest in Glaciogenic Microsedimentology. He is the author of numerous scientific journal papers and of several books including Modern & Past Glacial Environments – a revised student edition (2002). He continues to collaborate with fellow researchers, for example, in Austria, Switzerland, Germany, Poland, Denmark, UK and the USA. Professor Jaap JM van der Meer , MSc, PhD is Professor emeritus of Physical Geography at Queen Mary, University of London. He obtained a BSc, MSc and PhD at the University of Amsterdam where he was a Senior Lecturer until 2000, when he moved to London. He retired in 2011.Glacial processes and resulting landforms and sediments were the focus of his research. On the general level he studied sediment transfer and (temporal) storage in the glacial system: from the ice divide to the shelf edge. More specifically, there are two clear elements in his studies: the first one is the study of glacial sediments especially in thin sections and the second one is the study of dynamic structures, e.g. push moraines or drumlins. His research is embedded in an international network, encompassing collaboration with colleagues from Western European, North and South American countries and Australia and New Zealand and fieldwork ranging from the Arctic to the Antarctic. He set up the Centre for Micromorphology University of London, internationally a unique research facility to study glacial sediments at all microscales.